surprised this has not been reviewed yet ! Re: Prog 2127 - Have you had your Thrill Fix ? Bloody thing hasn’t turned up yet! Ditto. Meg - yes. Prog - no. Then again, neighbour two doors down brought contact lens pack that had been shoved through her door. Will see what today does/nt bring. It landed on my doormat on Saturday and it's a pretty good prog. Not up to last week's, but still enjoyable and no duffers. Dredd is a bit exposition heavy, hopefully things pick up next week. Survival Geeks wraps up well and has a wonderful homage to Marvel on the last page. It suggests the next series will be the last and I'll be sad to see it go, there's nothing else like it in the prog these days and there should always be a place for something light-hearted in 2000AD. Kingmaker shows some great promise but once again treads the line between homage and copy. I'm not sure it's the right side of the line this week. Maybe there's a twist next week? Scarlet Traces benefits from some magnificent artwork. Lovely stuff. Max Normal remains a highlight, but the clever wordplay of previous weeks isn't quite there. Still great, though. Dan Cornwell is doing great work just now. Apologies to the folks who didn't get their prog this Saturday - I got 2 copies! And the Meg. Both addressed to me, so not depriving another Squax of his thrill-power. Some poor droid is due a visit to Mek Quake! The Dredd story is interesting, not much need for Dredd though, more like a Brubaker/Phillips Criminal story. Enjoying Max, Kingmaker and Scarlett Traces. Agree with what was said above, that Kingmaker's on thin ice...but still enjoying it. A fair-to-middling prog this week. That tag-line matches Betteridge's Law of Headlines, to whit: "Any headline that ends in a question mark can be answered by the word no." Me neither, hoping it will be on the mat when I get home today - but when prog 2125 failed to arrive, I had to call the subs line for the first time in ages - the young lady I spoke to was no Denise, but she was equally helpful and efficient and had a replacement prog out to me in a a couple of days. I assumed that bit in Dredd is going to be explained later. 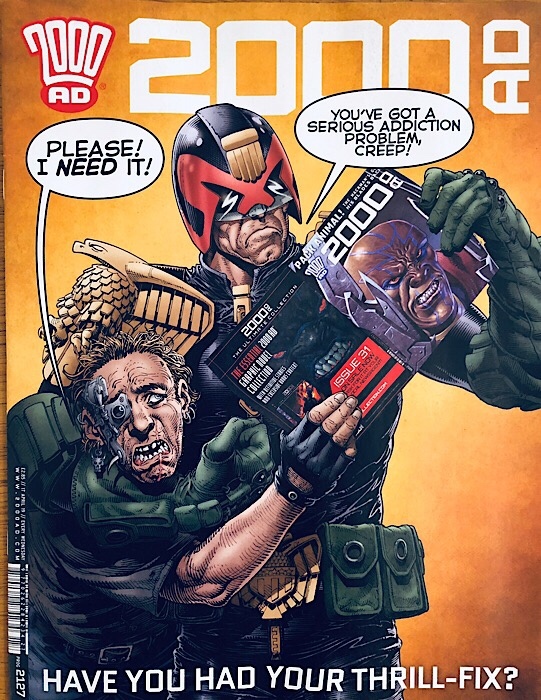 Is it me or is some of the colouring in Dredd a bit confusing? When Tomlinson is shown being taken out by Dredd he has grey hair. In the meeting with the Kindred he has reddish brown hair. Also Fischer’s hair seems to change from blonde to red and then to a sort of strawberry blonde.